Okay, you are in LUCK because today I’m spilling the beans on our awesome zero waste advent calendar so that YOU can have a low waste holiday too! Rather than focusing on things, we use the holidays to focus on experiences together and soaking up all the holiday awesomeness as a family. My kids get SO excited for the advent calendar – they’ve been talking and asking about it for weeks. They remember these mini-adventures more than any gifts. Our actual advent calendar is a hanging fabric tree with 24 pockets. We write the activity on a little slip of paper and put it in the pocket. But you could use anything that lets the kids track the days and read the event for each day. Check pinterest for loads of cute ideas. So, if you want to make the holidays more memorable for you and your kiddos, and focus on experiences rather than things, here’s my guide for you. Whether you buy one or have an artificial one, or hang something simple on the wall, this is a great family activity. We have a couple big bins of ornaments that we put up every year. Mixed in with our tree ornaments are a few other decorations – gifts from my mom – including a nativity scene, mini Christmas carousel trees with candles, and some nutcrackers. We’ve made a few garlands too that we hang. We have this awesome spot in town to make wreaths called Rancho Del Oso. But you could make one with scraps from a Christmas tree yard, or go onto Pinterest for ideas that don’t involve real tree scraps. I’m not sure about you guys, but we love singing in our house. We get the lyrics to a few popular songs and light up our Christmas carousel trees and sing a few together. We even recorded ourselves singing one song and shared it with close family (ONLY!). All this takes is a few sheets of paper and scissors. We love to hang them in the windows once we’re done. If you’re ambitious, make enough for a strand of snowflakes. So cute. We still do gifts and ask our kiddos to pick one thing to ask Santa for. Something within reason, of course. We get veto power (Apple watch? I don’t think so). We don’t watch a ton of movies so this still feels special for us – Elf is one of our holiday favs. 8. Hot chocolate for breakfast! We don’t normally make hot chocolate, so it feels special. AND it’s easy to do before school. Win Win Win. Okay, this is another thing, but it’s awesome for busy school mornings to just slip a little something in the calendar. We’ve done bulk candy before and little hair barrettes. Maybe a tiny glitter crayon, a tiny notecard, or necklace charm. Or a tiny succulent cutting (they’ll need something or somewhere to plant it, of course). Or a tiny eraser. Or a tiny magnet. Or a little homemade chapstick in a tiny jar. I try to think of stuff that isn’t just going to collect dust in their room, but might actually get used. Also, google tiny gift ideas for some of the CUTEST things you’ve ever seen. 10. Breakfast at Gayles – before school! I know this might feel a little crazy. But if you can get up a little extra early, maybe pack lunches the night before, you might be able to get a nice quick bakery breakfast before school. It feels extra special this way. Another before school treat, if you can fit it in. Or bring it home to them. Either way, we don’t get a lot of donuts around here, so it’s an indulgence. These can be a little pricey, but it is super memorable for them kids. And it could be a great gift from grandparents, if they need ideas. (Hint hint, mom 😉 ). We don’t do all of these each year – usually just one. An annual tradition that they look forward to each year. I look forward to the cookies. We have grown-up friends who are like aunts to the kiddos. We make a special effort to schedule something with them during this time – a little tea party or making ornaments together. Okay, this is a thing but it’s also an experience. They each get to pick out one ornament a year. The kiddos get super excited about this. I think it’s not about the actual ornament, but really about looking at all the shiny and creative options at different stores – surfing pink flamingo for the tree? Yes, please. I try to come up with a few simple craft ideas that we could do in an hour after school (a simple necklace, sculpey ornaments, popcorn garland, or other simple garland) and then let the kids pick one for us to do. Any holiday parties? Put ‘em on the calendar! We have a family birthday during this time, so that party counts as one of our advent calendar events. And we try to think of others who are in need during this time. 20. Get gifts for a family in need and wrap them. Their school often adopts a family, and a lot of churches do this too. Rather than making this an errand for MOM or DAD, this is a family affair – we go together to pick it out and the kids wrap it up themselves. Last year the kids spent a morning volunteering at an organization that was wrapping gifts to donate to families in need. This one is a little tricky because it might not be easy to find something to volunteer for if you aren’t already involved with the group. And finding something that’s age-appropriate can be challenging too, so call around to find some options. And scheduling this can also be tricky when weekends are already jam packed. So plan it out in advance! We ask the kids to pick one of their gently used toys to donate. Last year this ended up being a major toy closet clean-out, which was awesome. But in other years, when they were younger, picking just one toy was a good goal. 23. Night time Light walk . We bundle up and grab an umbrella if it’s rainy. We usually walk over to Depot Hill in Capitola for an awesome view of the town and all the lights at night. It’s fun walking in the dark and cold together. And this is an easy after-dinner activity too for those busy weeknights. This does require a little planning and effort, but it is so worth it. We make a ton of finger foods including mini sandwiches (cream cheese and cucumber, peanut butter and jelly), deviled eggs, hummus and veggies, fancy olives from the bulk bar, popcorn, maybe some cookies or other baked goods and tea, of course. We sit on the floor in the living room and eat around the coffee table. I love this dinner so much. 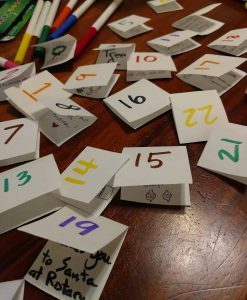 easy zero waste advent calendar ideas. Do you have any to add? I’d love to hear about them! Share in the comments!